Chance for Glory is a variation on the famous Final Fortune from Mirage, but possibly even more extreme. An issue with Final Fortune has always been that you needed to have some way to win already, either in your hand or ideally on the table. Chance for Glory offers you a hook to setup that winning turn, with the indestructibility clause letting your creatures attack fearlessly. This also offers some interesting non-standard uses – if for any reason the game doesn’t end the next turn, the creatures you controlled when you cast Chance for Glory will always be indestructible. Triggered abilites are hard to stop, but not impossible – this might be a good time to dig up your old copies of Trickbind (which is almost impossible to stop!). While blue might be the iconic “take lots of extra turns” color, red has dipped a toe into it on occasion, always with a bit of a steep downside appended to it. Losing the game is usually a steep downside, right? 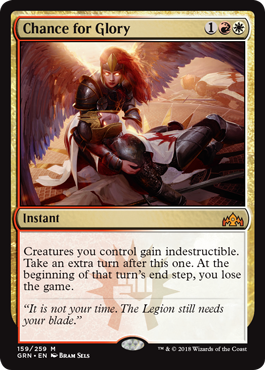 But now we get our first red “extra turn” spell since 7th Edition, though now in Boros colors. Chance for Glory is big, flashy, and a way to go out in a rain of heavenly bloodshed and glorious violence. Three mana puts your shields up for one final swing…and creatures you control become indestructible for the rest of the game. This might normally be until the end of the turn in which you lose, but there are ways to duck around Chance for Glory’s slight downside. (Angel’s Grace, Platinum Angel, Sundial of the Infinite, Time Stop, anything to counter triggered abilities…and I guess Glorious End also can help in that regard.) Making sure your creatures will almost always get one last chance to charge into the enemy lines, even without abusing it, will always be a way to steal wins from a seemingly hopeless situation. I’m not sure how good Chance for Glory will ultimately be; it’s powerful, but hard-ish to abuse right now in Standard, and it might not quite get there in Modern or Legacy. But a three mana instant with such a powerful effect is always a card worth taking a gamble on, and being in white allows for some tools to try and duck around the downside.